Two super cops are involved in a wild and crazy car chase with guns flaring. Highsmith (Samuel L. Jackson) and Danson (Dwayne “The Rock” Johnson) are what every typical movie cop buddies want to be. They are so confident and out of control, but they always bring in the bad guys no matter what the cost in damages. They are such heroes they don't even do their own paper work because it's too dang boring. 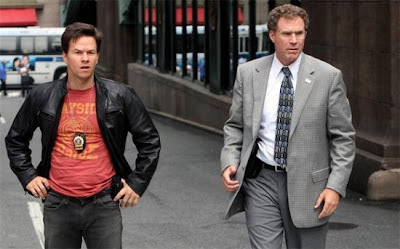 In their precinct there's the hero cops and the “other guys” like Allen Gamble (Will Ferrell) a mild mannered transfer from forensic accounting desk jockey and Terry Hoitz (Mark Wahlberg) a once ambitious detective who is living down a huge error at a Yankee's game making him a laughing stock. Gamble is good natured to Hoitz's constant anger and harassment regrading his masculinity because he would rather work safely at his desk then on the streets. Gamble is so clueless he manages to have his gun replaced with a wooden replica by his boss, Captain Gene Mauch (Michael Keaton). When Highsmith and Danson make a tactical error when on a case, the rest of the department's teams want to step in their place. Hoitz has to pull a gun on Gamble to get him on the streets. Gamble justs wants to investigate a white collar crime involving scaffolding. They are denied a patrol car and have to ride around in Gamble's bright red Prius. There's a running gag about the Prius and some homeless group party for the gross factor. Every attempt they make doesn't turn out as well as they hoped. They do manage to arrest David Ershon (Steve Coogan) for the scaffolding scam, but the rich investor has other problems when he's kidnapped from their custody. Captain Mauch takes them off the case but Gamble and Hoitz want to figure out what's going on.